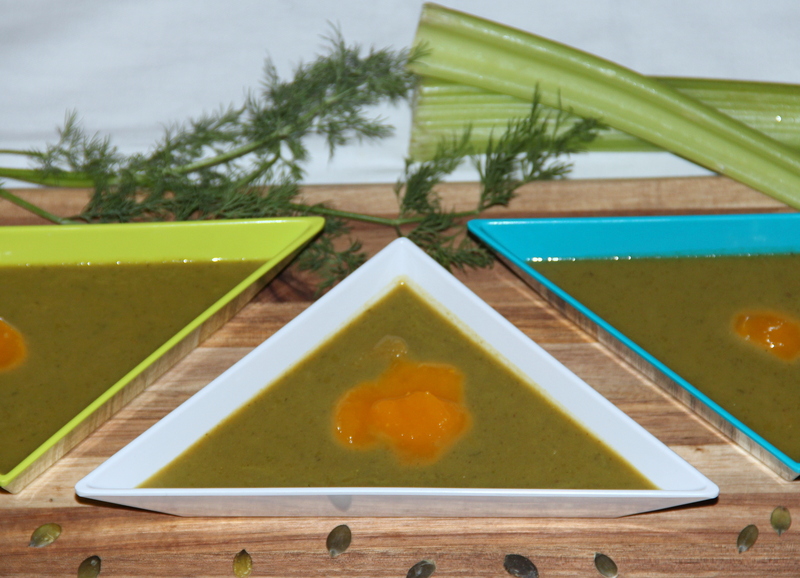 This is a hearty soup for the wintery day with the blend of celery, pumpkin with dill leaves. It gives a lovely green colour to the soup and adds aromatic flavour. Milk helps for the perfect consistency of this soup. Alternatively rosemary or any herbs can be used and feel free to personalise as per the taste. Heat oil in a deep pan, add the onions and saute for 3-4minutes. Add spices and herbs (ginger, garlic, dill leaves, nutmeg, pepper corns, cinnamon) and coo for 1-2minutes. Once the spices and herbs have released their flavours, add the pumpkin, celery and saute for 4-5minutes. Once the pumpkin is cooked, turn off the flame and allow it to cool a bit. Then blend in the food processor/blender until creamy and soft. Transfer the blended puree back into the deep pan, add in milk mix well and cook on a medium flame for 3-5minutes, while stirring continuously. Cream can be included if desired. Herbs and spices can be personalised as per the taste. I used more dill leaves so my soup turned gree, you can reduce r personalised dill leaves quantity as per the taste. Posted on November 4, 2014, in International, Soups, Salad and Wraps and tagged Chitras healthy kitchen, drchdietfood, Vegan soup recipes. Bookmark the permalink. 20 Comments. Still got PUMPKIN left over from your Halloween carvings?